All 52 passengers from the ship stuck in Antarctic ice have now been transferred by helicopter to an Australian icebreaker, the Australian Maritime Safety Authority said on its Twitter account. "It's 100% we're off! A huge thanks to all," tweeted Chris Turney, an Australian professor among the group of scientists, journalists and tourists stranded on the ship for more than a week. A helicopter from a nearby Chinese icebreaker ferried passengers. The rescue is the latest chapter in a saga that began Christmas Eve after the Russian-flagged MV Akademik Shokalskiy got stuck in unusually thick ice. Officials abandoned a succession of other rescue attempts in recent days because of the treacherous conditions in the region. It will still be weeks before the research team will make it to Australian port of Hobart, said John Young of the Australian Maritime Safety Authority (AMSA). "Mid-January is our best guess," Young told reporters on a conference call. The Australian icebreaker, the Aurora Australis, is still expected to complete a resupply mission to Casey Station, an Australian base in Antarctica, before making its way to Hobart. Meanwhile, the master of the Akademik Shokalskiy has decided to keep the 22 Russian crew members on board the stranded ship until the pack ice eventually breaks up and allows it to move again, Young said. The vessel has enough supplies to keep the crew going for "a very long time," he said. 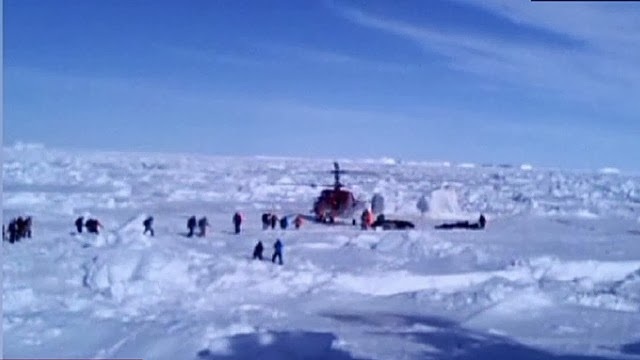 The helicopter rescue follows a failed attempt by a Chinese icebreaker, the Xue Long, which made it six nautical miles from the trapped vessel before being stopped by especially thick ice. That was followed by an effort by the Australian icebreaker, which was forced Monday to suspend efforts to reach the expedition because of bad weather. The Aurora Australis got within 10 nautical miles of the ship before it turned back. Over the weekend, an effort by the French icebreaker Astrolabe was called off by the maritime agency. The exploits of the research crew have gone viral, thanks in large part to Twitter and YouTube posts by those aboard the stranded vessel. Turney, the leader of a research expedition on the Akademik Shokalskiy has tweeted photos of the stranded ship, the crew and penguins, who have stopped by to check out their new neighbors. The group even managed to ring in 2014 with good cheer. "We're the A, A, E who have traveled far, having fun doing science in Antarctica!" a dozen or so of them sang in a video posted on YouTube. "Lots of snow and lots of ice, lots of penguins, which are very, very nice! "Really good food and company, but a bloody great shame we are still stuck here! Ice cold, cha cha cha! Ice cold, cha cha cha!" Turney's expedition to gauge the effects of climate change on the region began on November 27. The second and current leg of the trip started on December 8 and was scheduled to conclude with a return to New Zealand on Saturday. The vessel got stuck in the ice 15 days after setting out on the second leg. Turney, a climate change professor at the University of New South Wales, has said the ship was surrounded by ice up to nearly 10 feet (3 meters) thick.